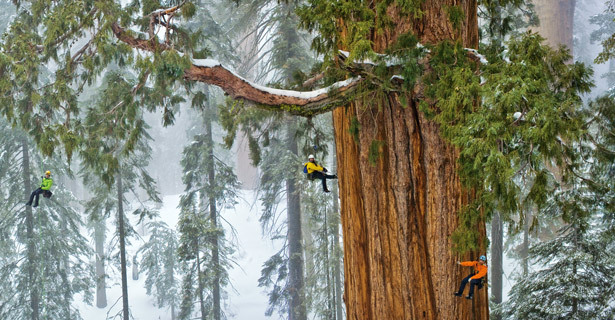 Researchers climbing the enormous sequoia known as The President. (Image: Michael Nichols/National Geographic). Trees are fantastic. As well as being beautiful they give us shade to rest in, oxygen to breathe and something to climb. Some trees are very old and some trees are very tall, but only a few species are both; the tree known as The President is a giant sequoia (pronounced sek-OY-a) and it grows in the state of California, USA. The President is 3,240 years old. When it was a sapling, humans in Europe were just working out how to use iron instead of bronze. It began growing at about the same time that the Egyptian pharaoh Ramses II built his temple at Abu Simbel, and only a century after the death of Tutankhamun. At around the same time the Assyrians conquered Babylon, the conflict that gave rise to the legend of Trojan War happened, and the Olmec civilisation in Mexico was just emerging. It’s truly astounding to consider how long The President has been alive. It’s enormous too, the second largest tree in the world. It’s more than 75 metres tall, while its trunk is 9 metres from side to side and and measures over 28 metres around. Giant sequoias only grow for 6 months of the year, but in that time The President grows a whole cubic metre, making it one of the fastest-growing trees in the world. It has almost 2 billion leaves! Giant sequoias grow so old because they’re not vulnerable to very much. They’re too strong to be blown over by wind, and their wood is so old that it’s not much use for humans, so logging isn’t a threat. Their trunks and branches contain chemicals that prevent infestations of wood-boring insects, and their bark is fire-resistant. Even lightning doesn’t damage them much! Spending a significant part of the year weighed down by snow doesn’t harm them either, and they actually prefer wintry conditions. Professor Stephen Sillett, a botanist from Humboldt State University in California, has spent a lot of time examining The President. He and a team of researchers climbed the enormous tree and measured it; not just its height but also its branches, cones and growth rings in the trunk. Because of its size it’s impossible to take a single photograph that shows the whole tree, so they also took 126 photos which were later combined into this single, astonishing image. The researcher standing at the base of the tree gives a sense of how truly gigantic The President is. The researcher at the top appears larger because they’ve walked along one of the enormous branches and are standing a lot closer to the camera. (Image: Michael Nichols/National Geographic). I absolutely love reading about things like this! I had no idea this particular tree existed – how very cool indeed!